Blue River. Maps of river and Maps to public access points and liveries. Submit your trip report now! The verbiage below was supplied by Indiana DNR's Canoe Guide. The information was last updated at least 16 years ago. Put-in points have disappeared and new ones have formed since then. It is very important that you submit any trip reports that you have and include what the put-in and take out points look like. With your help we can build a new and improved Indiana Canoe Guide. We will revise the information below as new information presents itself. If you have a favorite river, chances are that you know it best. You can adopt a river for this site, then write about it and describe the put-in points. You will get full credit and you will be doing ALL Hoosiers a big favor. Blue River flows through one of the most scenic, interesting and diverse areas of Indiana. There is the opportunity to experience the pastoral tranquillity of rural farmland, extensive forests, numerous caves, and a wealth of historical attractions. The river originates in Washington County in southern Indiana, and for a portion of its journey to the Ohio it forms the boundary between Harrison and Crawford Counties. It is an entrenched stream whose meanders have cut deep into the Mississippian limestone bedrock. A series of "half canyons" lie astride the Blue never completely enclosing it. The Crawford Upland region is typical of a karst (limestone) topography with its many sink holes and caves formed as water dissolved the rock. The limestone walls along the river are usually shrouded in a heavy cover of trees and shrubs. Rock is a constant feature of the stream bed, but much of it is covered by sediment. The rapids reveal gravel bars, however, and the canoeists must remain alert for submerged boulders which can be quite hazardous. The width, depth, and gradient of the river vary, but it is about 85 feet wide. Average depth is about five feet deep, and the river falls at about four feet per mile. The Blue River area was first explored by Squire Boone, Daniel Boone's brother. He found large Indian populations whose sites can still be found today. Above Fredericksburg, the river does not have any known Public access points. Trips on this stretch above Fredericksburg can be arranged by contacting Old Mill Canoe Rental. A long day's trip can be had by putting in at Lamberts just downstream of the U.S. 150 Bridge in Fredericksburg. This is a rather strenuous 24-mile float. Take out on the right bank at the old iron bridge in Milltown. This is just above the dam. Immediately downstream of the bridge is a dangerous dam which will require a portage on the right bank. To reach Milltown by auto from Fredericksburg, take U.S. 150 west from Fredericksburg to the junction with State Road 66 from the south. Turn left (south) and proceed about 7 miles, crossing State Road 64, and continue into Milltown to the access site downstream of the iron bridge on the right bank. Check the map area on this site and you can create a route map. A shorter trip can be arranged by taking out on the right bank downstream of the Totten Ford Bridge. This is not a public access point, but arrangements can be made to use the access point by contacting Cave Country Canoes. From Fredericksburg to Totten Ford is approximately 17 miles and takes about 5-7 hours to canoe. The route from Totten Ford to Milltown is about 7 miles in length and should require 2-3 hours to float. Another day-long trip would be from Milltown to the Rothrock Mill Access Site owned by the Department of Natural Resources. The trip is about 14 miles in length and should take 4-6 hours to float. The access point in Milltown is downstream of the dam right behind Cave Country Canoes. Check out pictures of it HERE. This is Cave Country Canoe’s 14 mile trip. Watch for the iron bridge about 800 feet upstream from the Rothrock Mill Access Site and take out on the left bank at a gravel ramp and wooden steps. You may picnic at the access site, but overnight camping is not allowed. To reach the mill by car, take Leavenworth Road south from Milltown about 4 miles to Old Mill Road where you turn left (east) and follow this primitive road about 2 1/2 miles to the river. Cross the bridge and watch for the access site on your right. Interactive maps between any access points can be generated by the maps section of this site. Two great cabins are available for rent along this section. Both offer private river access. One sleeps 12 and the other sleeps 4. More info can be found at www.AlongBlueRiver.com. The float from Rothrock’s Mill Access Site to Blue Chapel Public Access Point is about 10 miles long and takes 3-4 hours. This section of the river flows under Interstate 64 and State Road 62 before encountering another old mill dam near White Cloud. You may be able to navigate through the middle of this small dam since it has also been breached, but you may also want to portage around either side of the dam, particularly if the river is above average flow. Continuing the float, you will come to the State Road 462 bridge in about 2 miles; within another 1/2 mile, a Department of Natural Resources access site is available on the right bank (near Blue River Chapel) just downstream of the bridge. You will see a somewhat narrow concrete ramp extending to the river. Another mile will take you to a large "horseshoe" bend in the river, on the right bank is Stagestop Campground, owned by the Department of Natural Resources. You will also be able to exit the river at the Stagestop Campground sign. From Rothrock Mill Access Site to the access site near Blue River Chapel or to Stagestop Campground, two shuttle routes may be taken. Leaving the mill, go southeast on Rothrock Mill Road and immediately turn right (south) onto Burgess Circle Road. Follow this road along the river and turn right (south) at the next road, which is Moberly Road. Turn right (south) at Harrison Spring Road (paved) and follow it south to State Road 62. Turn right (west) on State Road 62 and another three miles will take you to the road to Blue River Chapel and less than another 1/2 mile to the road to Stagestop Campground. Both roads are on the left (south) side of the road. You can get interactive maps in the maps section of this site. NOTE: Stagestop Campground is CLOSED until further notice. The next official access point past Stagestop Campground is called Old Iron Bridge. This is about 7 miles downstream of Stagestop Campground. The Old Iron Bridge makes for a great access point with plenty of parking and a nice concrete ramp down to the river. The ramp is capable of supporting motorized boats that need to back down a traditional ramp. In about 3 more miles you will encounter the mouth of the Blue River. A Department of Natural Resources access site is located on the right bank at the confluence with the Ohio River. The lower several miles of the river are very slow flowing. The road to the access site at the Ohio River is indicated by a boat ramp sign and arrow pointing to the south on State Road 62 about 4 miles west of the road to Stagestop Campground. 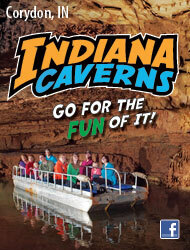 Check out my sponsor for a fun trip down one of Indiana's most scenic rivers! We need more trip reports. E-mail your trip reports to us by Clicking Here! © Copyright 2000-2019 The Technological Edge, Inc.